As I have spent time in the Halsey Institute’s main gallery with Erwin Redl’s Cubes installation the last three weeks, I have developed a stronger sense of how viewers react and interact with a piece such as this one. The work consists of three separate groupings, each made of sixteen cubes. 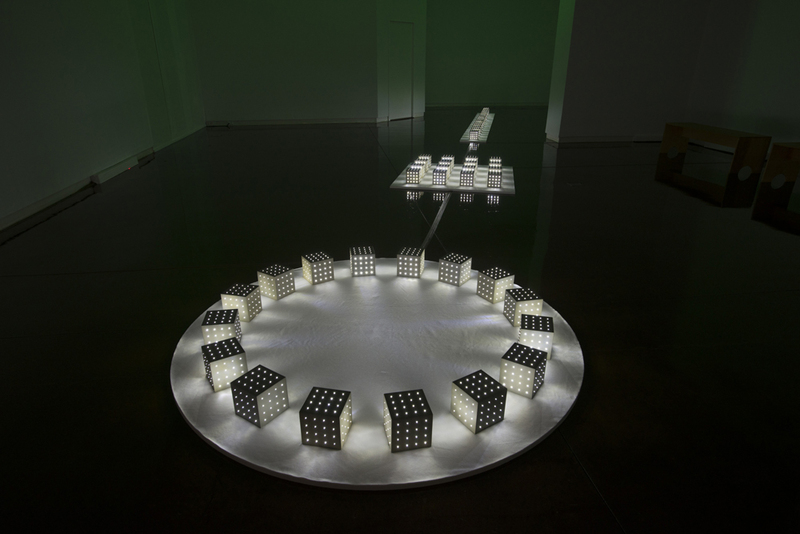 The cubes are animated with fiber optics and white LEDs that alternate by blinking on and off, as the installation goes through its programmed sequence. Each group of sixteen cubes is placed in a different configuration on a unique platform. As you enter the large, darkened gallery space you will first be confronted with a circle of cubes, followed by a square and then a long rectangle that extends towards the back of the main gallery. It has been interesting to observe how a light installation impacts a viewer differently than say, an oil painting. Cubes is a piece that you experience in addition to simply viewing. One important aspect when investigating the effect of such a piece is the phenomena of afterimage. Afterimage refers to the image that continues to appear in one’s vision after exposure to the original image has ended. The most common example of an afterimage is the light that one sees in their eyes after a flash photograph has been taken. 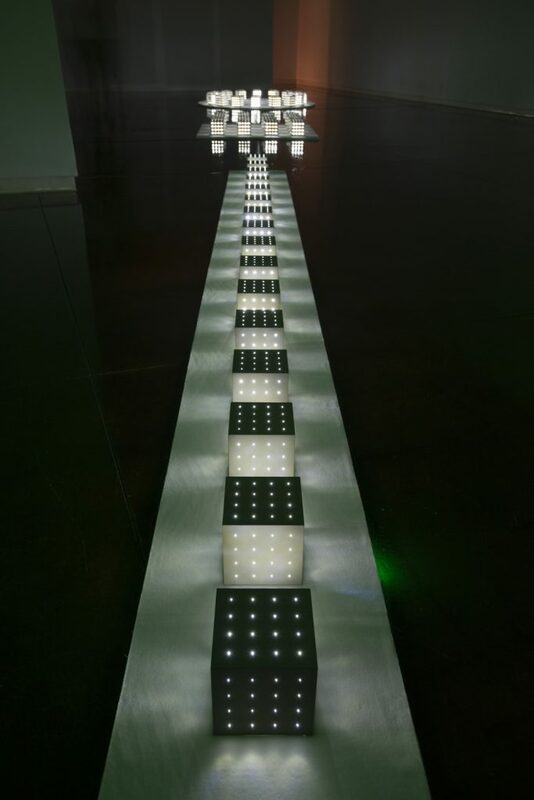 The programmed sequence that Redl utilizes for a light installation such as Cubes creates a similar effect. After leaving Cubes or closing your eyes, you are left with a visual impression of the blinking LEDs. In the exhibition video produced for Rational Exuberance, Redl states that he hopes his pieces inspire a sense of calm in the viewer. The goal of this desired effect might be in reaction to the hectic pace of his current life, which he also references in the film as well as harkening back to his time spent growing up in the Austrian countryside. 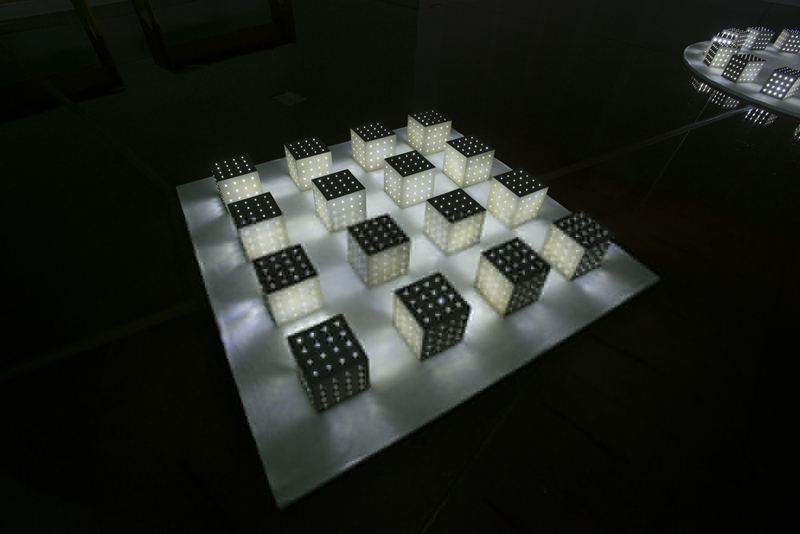 In the film Redl also states that the “slow processes in nature are very influential to [him].” This influence can be seen in the programmed sequence created for Cubes, where the LEDs alternate on and off in a cycle that works to create a very calming experience and could be seen as reflecting structures and patterns found in nature. For some people the experience of seeing Cubes is very meditative and they choose to spend a long period of time in the large gallery with the installation. In modern daily life it’s rare to have an opportunity to sit alone, quietly without distractions. The darkened gallery makes it possible to feel that you are completely alone, even when others are in the space and there are benches in one area, so visitors can sit and watch the full sequence unfold. The patterns of light provide enough structure to require focus, an aid similar to other techniques used for meditation, while the overall minimalism of the piece – lights, squares, circles, lines, and darkness – cuts out the distraction of complexity. For others, the piece is less transfixing, and they choose to spend more time in other parts of the exhibition. Many people, particularly younger visitors, seem to prefer the excitement and entertainment value of Ascension in the smaller gallery, where 24 Ping-Pong balls are animated by programmed fans creating movement and sound in a circle of 24 glass tubes. Cubes is more subtle, however, for the right person, the slow movement of light and shadow can be very appealing and provide them with an experience that is both meditative and calming. 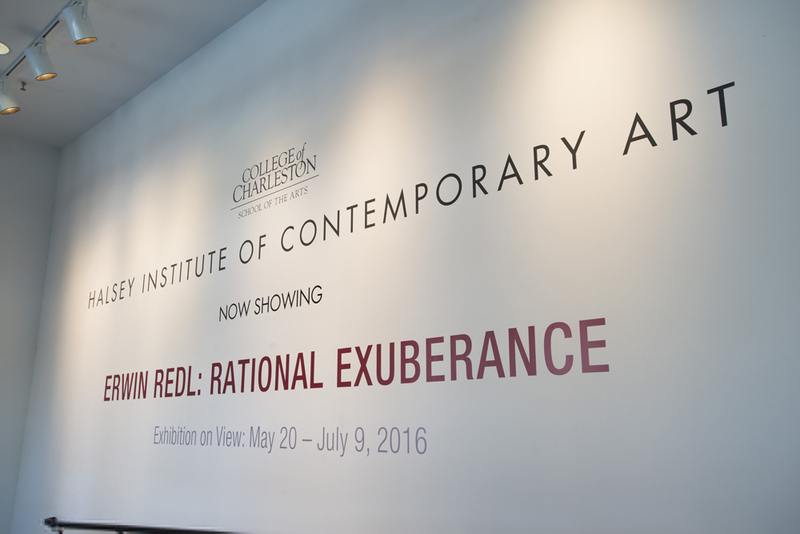 Redl’s Cubes as well as the rest of his Rational Exuberance exhibition will be on display at the Halsey through July 9th. Don’t miss the chance to experience it for yourself.